Any true aficionado of horror has got to have a soft spot in his/her heart for the anthology film. Emerging from such firmly entrenched precedents as old EC Comics (and adapted works based on them, e.g., Tales From the Crypt and Creep Show), radio spook shows Lights Out and Inner Sanctum, classic TV fear fodder like Boris Karloff’s Chiller, Alfred Hitchcock Presents, Night Gallery, Tales From the Darkside, and Twilight Zone, not to mention short fiction collections ranging from M.R. James to Stephen King, the horror anthology is an effective method of giving the consumer maximum bang for the buck in terms of mood and menace. And unlike an entree on Chopped, it is possible to enjoy or hate individual sections without the need to judge the work as a whole. Of course, you’re entitled to do that too—it’s your dime, it’s your time. Scary Or Die‘s wraparound premise focuses on an anonymous ghoul doing some late-night web surfing, selecting different horror tales from a menu of choices. (How bloody contemporary!) The first, “The Crossing,” stars our old friend Bill Oberst Jr (who could ever forget A Haunting In Salem? ), as Buck, a despicable truck-driving redneck vigilante, who hunts illegal immigrants along the border between Arizona and Mexico. In the blunt-as-a-brick denouement, Buck, his dumbbell pal, and inexplicably hot gal, who, bless her heart, doesn’t approve of killing unarmed Mexicans, meet a very sorry fate when a whole graveyard of Buck’s past victims crawl out of the ground with a vicious case of the munchies. It’s gross, crude, and predictable, but reasonably satisfying. “Taejung’s Lament” is an elegant stylistic contrast, the story of a man (Charles Rahi Chun) who ghost-walks through his days, forever mourning his late wife, until he rescues the beautiful and mysterious Min-ah (Alexandra Choi) from an assault, and presto, he’s completely under her spell. (Note: We figure out she is a vampire way, way before he does.) Tastefully shot at night in Los Angeles, this one has a haunting, minimalist quality that visually compensates for a twistless plot. In “Re-Membered” a hit man (Christopher Darga) gets more than he bargained for when his latest mark turns out to be a clever and very-hard-to-kill sorcerer. It’s another adequately suspenseful entry with few surprises. The strongest episode is “Clowned,” about an amiable coke dealer named Emmett (Corbin Bleu) who suffers an unwanted clown bite at his little brother’s birthday party. The idea that clowns, like vampires and lycanthropes, can create more of their kind through a bite, is quite a good one, and soon poor Emmett begins to undergo a hideous (and hilarious) transformation. Oh yeah, and he craves human meat, especially that of his innocent hermano. This one also has an unexpectedly funny exchange of dialogue between two detectives arguing over the difference between a clown and a mime. I’m sorry, but if you can’t appreciate the universally grotesque charm of flesh-eating clowns, then what good are you? The final segment, “Lover Come Back” is a standard tale of love and revenge, with a voodoo priestess (Shannon Bobo) rising from the grave after she’s betrayed by her faithless lover. Moral: Don’t ever fool around on your sweetie if she’s got strange and terrible powers. Seriously, I need to tell you that? 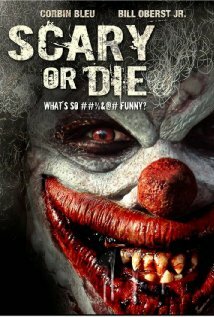 Writer-directors Bob Badway and Michael Emanuel don’t bring anything new to the table (aside from the cannibal clown mythology) in Scary or Die, but neither do they commit any egregious errors. There’s not much depth here, but your hunger pangs will be momentarily sated.